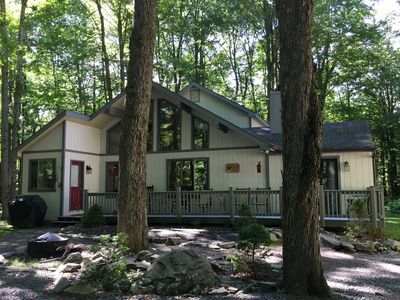 Situated on a quiet, semi private block this 4 bedroom + loft and additional walkthrough room with bunk beds is the perfect place for a family getaway. 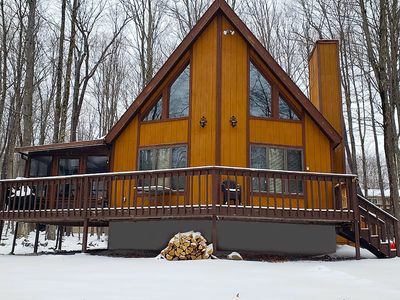 This cozy and comfortable chalet-style home seems charmingly remote, but in fact is within the private Arrowhead Lakes community. The home is surrounded by trees which can be viewed from every window, yet also gets a surprising amount of sunshine. It is a perfect nature getaway, offering a quiet retreat for sipping your morning coffee and relaxing. The large kitchen table is ideal for a family game night. 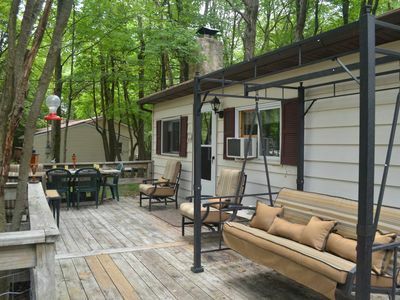 The deck has a table and chairs as well as a nice gas grill. 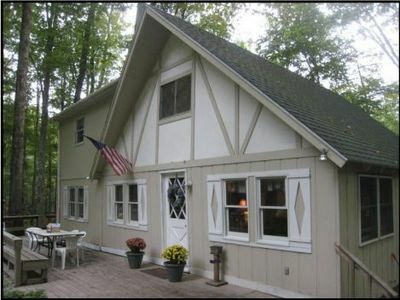 Besides the charming home, the amenities of the Arrowhead Lakes community are many. 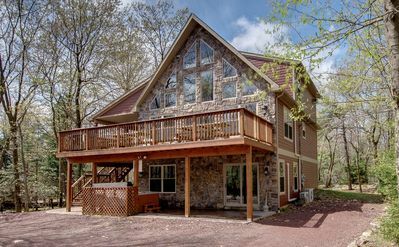 With 2 large lakes, clean beaches, and numerous events throughout the year, this charming Pocono community is the perfect destination to escape the stresses of everyday life. 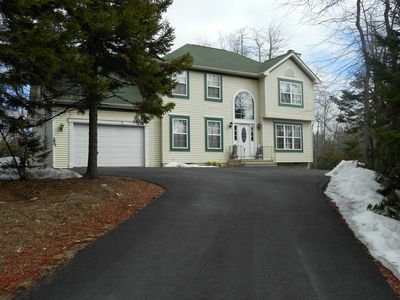 The house sits on the end of a cul-de sac with limited neighbors, so you really get the feeling of privacy. However, just about two blocks away is the Clubhouse, where family events take place and the best sledding hill in the region can be found (also horseshoe pits, basketball court, softball field, and playground in warmer weather). Beach #3 is the closest, and is just over 1/2 mile away at the other end of Towanda Trail. * 4 beaches with boat docks, playgrounds, food concessions, and fishing areas (Beach 3 is the closest, and is just over 1/2 mile away at the other end of Towanda Trail.) All pools and breaches have parking available. Bike and boat rentals available. 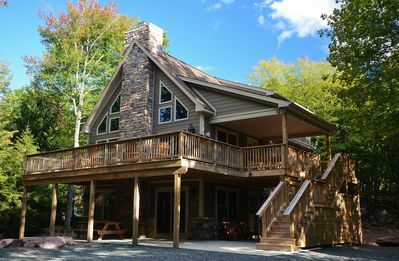 *New Lodge (a separate building from the clubhouse), with billiards, fitness room, library, lounge area, and many social events throughout the year, such as family movie nights. 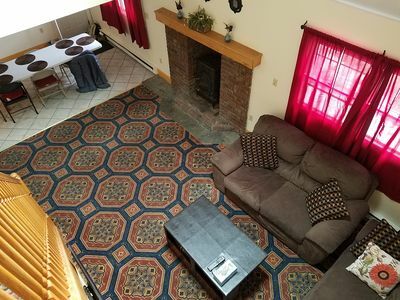 4 bedrooms: 2 with double beds, 1 with twin beds, 1 with trundle bed, and a bonus walkthrough room with bunk beds (you need to walk through this room to get to a bedroom with a double bed). The loft has a queen pullout sofa. (Sleeps 9). - Cable TV, DVD, VCR with a selection movies for children and adults. The house gets lots of sun and many of the rooms have been recently updated. 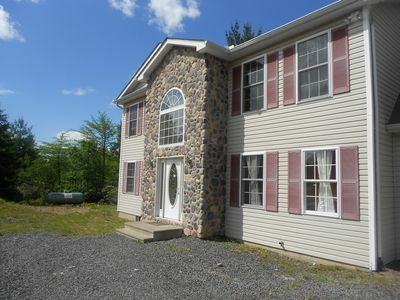 House has Washer/dryer, 2 full bathrooms, Wood burning fireplace as well as a pellet stove. 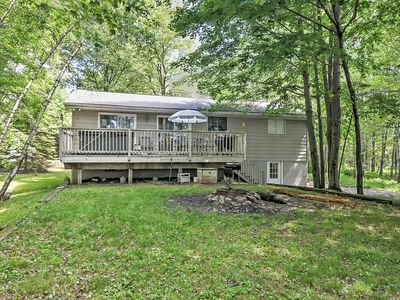 Outdoor deck with gas grill for enjoying the outdoors and spying wildlife (have seen deer, hawks, wild turkey, flying squirrel, woodpecker). Star gazing off the deck. There is a booster chair and brand new pack and play available for use. Nascar racing, outlet shopping, restaurants, paint ball, golfing (Jack Frost National and Split Rock among others), Hickory Run State Park, Lackawanna State Forest, Casinos, Skirmish, Whitewater rafting, Camelbeach Water Park, and nightlife are also just minutes away. For winter we are located near Jack Frost, Big Boulder and Camelback ski areas. Camelback transforms into Camelbeach- the best water park around! The ski areas also have events during the other seasons as well. 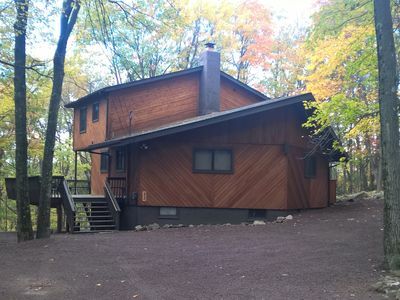 Situated in Pocono Lake , PA - Monroe county of the Pocono Mountain region in northeast Pennsylvania the home is located approximately One hour and 45 minutes from NY and Philadelphia. We ask that all beds are fully stripped for the cleaning person. We require a $300 refundable security deposit, which we`ll return within 2 weeks of your leave. This is a NON SMOKING, NO PETS house. Renters must be at least 25 years old. Arrowhead Lake requires renters (ages 7 and older) to purchase amenity badges from Saturday of Memorial Day Weekend through Labor Day weekend ONLY (Summer 'In-Season'). In-Season Amenity Fees: Daily = $8, Weekly = $30, Monthly = $80. 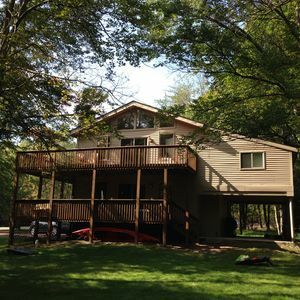 Pocono Lake Resort Home w/Hot Tub & Pool Table! Summer Vacation Destination! Arrowhead Lake in The Poconos!